The Fratton Faithful have been giving their verdicts on Pompey’s 2-0 win over Southend in League One. First half the boys played great football. Full of self confidence and belief. However, why don't they press on? 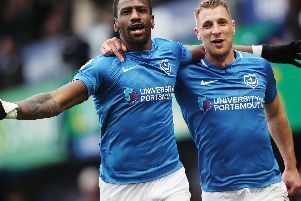 Psychologically, it is good for the team and good to show the opposition what Pompey can do if we bang in four or more goals. Had Southend pulled one back we would have been under pressure and that doesn't always bode well for Pompey! Yet another win and it was so comfortable as well. Curtis did very well and should have had 3 assists. Only criticism is I wish we would keep going and really put someone to the sword. We keep shutting up shop at 2-0. That said, it is getting results so we can’t complain too much at the moment! I agree about settling for a two goal lead in games – does turn the game into a bit of a bore. The first half Pompey showed what a good team they are and played some really attractive football at times. In the second half they just cruised through, which allowed Southend into the game. Maybe we could leave one or two up so that when the ball comes out of defence we could get some relief instead of the ball coming back in straight away? That said, we can't complain too much being 6 points clear can we? This Pompey defence has got to be the best in League 1, or at very least one of the best. They just seem so assured and solid and the two Thompsons were the stand outs for me today. Good win but why do we keep dropping deep? We need to play much higher up the pitch. It was a fabulous game to watch and all the lads played well. Well Done Pompey, KJ and the Boys!